The Berlin Wall is the symbol for the 40 year separation of Germany into a capitalist West and a socialist East. This unique cultural and historical period strongly affected everyday life in Germany – separated friends, families, a nation and the world. The class will explore the cultural, political and historical significance of the Wall in West-, East, and the reunited Germany in literature, film, visual art and music. The promise and bewilderment of the land of opportunity, the excitement and danger of the wild frontier, the corruption and power of organized crime, the breakneck pace of a New York career, and the broken dreams of Hollywood fame; these moments and more have been captured by German writers to fascinate their audiences with insight, humor, and a critique of American culture. In this course, students will read popular and renowned works by modern German speaking authors and directors and discover the many faceted landscapes of the United States as imagined through their uniquely German perspectives. This course is primarily focused on improving your German reading, speaking, and writing skills. In terms of a topical focus, our readings and discussions will examine representations of race and multicultural experience from Alexander von Humboldt’s first voyages to Latin America in the time of Napoleon and Goethe to modern representations of Latin American and Caribbean life during and after World War Two. We will also look at some Mexican surrealist paintings and installations as by Diego Rivera, David Alfaro Siqueiros, and Frida Kahlo. Prereq: 2102 and 2350, or equiv, or permission of instructor. Admis Cond course. Since the fall of the Berlin Wall and the Iron Curtain, and a century after Nietzsche’s famous proclamation that “God is dead,” we have allegedly been witnessing a global resurgence of religion and the beginning of a “post-secular age.” New, vigorous debates have emerged on the pros and cons of religion and secularization with respect to national and international peace, social justice, scientific development, and quality of life. For instance, in September 2012, the notorious “Mohammed video” sparked demonstrations and violence all over the Islamic world and renewed debates about where freedom of speech ends and hate speech begins. From the perspectives of the influential German traditions of philosophy, literature, psychology, and theology, this course explores the roles that religions can play in our modern societies. We will begin with an exploration of Kant’s notion of an enlightened and, simultaneously, divine community. Our investigation of this attempt to reconcile the Enlightenment with religion will be followed by a critical analysis of Marx’, Nietzsche’s, and Freud’s claims that religious belief is the “opium of the people” (Marx), luring them into submission. We will then discuss influential 20th-century theories of secularization: Max Weber’s belief that the spirit of capitalism is protestant and Carl Schmitt’s claim that true politics must be theological––that a head of state needs to act like a sovereign God. In addition to theories of secularization, we will explore 20-century attempts to adopt theology to the secularization of the society, including Martin Buber’s dialogic philosophy, Hans Küng's Reform Catholicism, and Dorothee Sölle's feminist theology. Through a select number of group projects and interactive presentations, students will also learn about and discuss the current significance of the historical ideas covered in this class. We will for instance, explore current debates about the relationship between religion and rationality, and contemporary economic, biological, and psychological explanations of religion. Students are also welcome to develop their own projects, for instance to conduct interviews on campus or visit a house of religious worship in Columbus. Taught in English. We will discuss both theoretical and literary text from Kierkegaard and Kafka to Heidegger and Sartre. Questions about the meaning of life are encouraged. Counts toward fulfillment of advanced requirement for the major. Taught in English. Prereq: 2102 and 3603, or equiv, or permission of instructor. FL Admis Cond course. 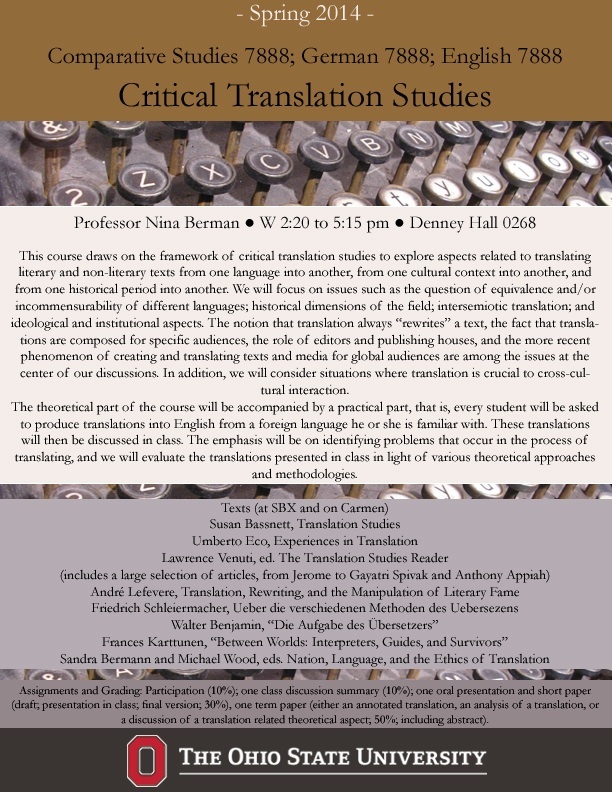 This course draws on the framework of critical translation studies to explore aspects related to translating literary and non-literary texts from one language into another, from one cultural context into another, from one historical period into another. Prereq: Permission of instructor. Repeatable to a maximum of 9 cr hrs. Admis Cond course. The notion of ‘barbarism’ and the figure of the ‘barbarian’ have played an important role in Western thought and been a constant part of our vocabulary since Greek antiquity. Within the age-old history of their usage, the terms ‘barbarian’ and ‘barbarism’ have always been regarded as being part of a dichotomous structure. ‘Barbarism’ is defined in opposition to ‘civilization’ or its equivalents. In this opposition, the ‘barbarian’ supports the superiority of those who assume the status of the ‘civilized’. ‘Barbarism’ reinforces the discourse of ‘civilization’ by functioning as its negative offshoot and antipode. As Reinhart Koselleck argues , this binary structure is characterized by an inbuilt asymmetry. It seems to draw a clear line between a ‘good inside’ and a ‘bad outside’, between a ‘we’ that assures itself of its superior value by pitting itself against an ‘other’ who is denied the achievements of civilization. The notion of ‘barbarism’ figures as one of the most steadfast and semantically saturated concepts in Western discourse, and it seems to be rooted in one of the most rigid hierarchial oppositions this discourse has ever produced. In the eighteenth century, however, the semantics of barbarism undergoes a significant transformation, which destabilizes the hierarchical opposition. The spatial concept of barbarism (inside vs.outside) is temporalized. Attempts are made to differentiate between ‘savage’ and ‘barbarian’ people. Barbarism is conceived of as a transitory phase that mediates between the savage state of nature and the state of civilization. Barbarism thus acquires the value of a third term that irritates the binary opposition between the savage and the civilized, between nature and culture. These attempts are undertaken within different discursive contexts: social theory and cultural history, philosophy, ethnography, aesthetic theory and literature. The aim of the seminar is to analyze how the shift in the semantics of barbarity manifests itself in modern culture. It proceeds from the hypothesis that the destabilization of the dichotomy between barbarism and civilization opens up new possibilites of recasting the ‘barbarian’ in ambiguous, experimental or even positive terms, as it can be found in the writings of philosophers such as Friedrich Nietzsche, Walter Benjamin, as well as in the works of literary modernism and the avantgarde. This seminar examines the relationship between workers, conceptions of labor, and the visual tradition in Germany since the middle of the nineteenth century. It is spurred equally by: the recognizable difficulty of using the expertise of artists and intellectuals invested in progressive solidarity to build the bridges that further it, on the one hand; and, the firm conviction that just such labor is necessary to envision it, on the other. We will explore this tension by investigating questions such as: How has “labor” been represented? What does it mean to “represent” workers? Why do workers seem to disappear from mainstream representations? Does self-representation answer that challenge? Is there a contradiction –necessary or productive or both – between aesthetic projects and the material realities determining and determined by work? What do new technical possibilities do to regimes of beauty, enjoyment, entertainment, and livelihood? What is the role of the history of art and thought in this? Requirements: Preparation and participation (20%); Presentation on secondary material (15%); Research Paper (65%) OR Exam (designed by student & instructor -- 35%) plus selected annotated bibliography (five titles, topic determined by student with instructor -- 30%). This course will introduce you to the many varieties of medieval "German" from the earliest attested texts ca. 750 until ca. 1200 (chronologically Old and Middle, geographically Upper, Middle and Low German dialects). By the end of the semester you should be able to read texts from an assortment of genres with the help of a dictionary and grammar. Class sessions will consist of translation and a discussion of grammar, the development of the language and of the cultural context in which this took place. For example, we will discuss phonological, morphological, syntactic and semantic innovations; how and why German came to parchment and how it was actually written; language use and choice. Students can choose to either write a seminar paper or to write 2-3 take-home exams. Knowledge of Modern German not necessary (but helpful). Knowledge of another historical Germanic language (Old English, Old Norse, Gothic) just as helpful. Contact Prof. Kaplan (kaplan.103) for information about the Scandinavian Program, our minor, and anything else Nordic.